Three cheers for a British supplier which provides an essential ingredients for several of our tastiest products. 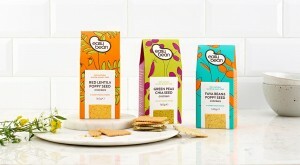 Suffolk-based Hodmedod supply pea flour, which adds protein and a delicious flavour to tour Fava Bean & Poppy Seed, Green Pea & Chia Seed and Red Lentil & Poppy Seed crackers. The company gathers various beans and pulses from farmers throughout East Anglia and mills them into flour before sending them onwards to our factory in the Somerset countryside. We’re so pleased with our links to this great company.